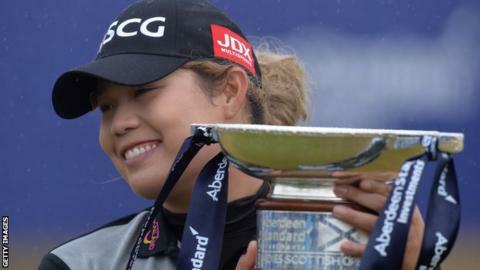 Thailand's Ariya Jutanugarn shot a final round 66 to win the Ladies Scottish Open at Gullane by a stroke. The 22-year-old held off Australia's Minjee Lee, who matched Jutanugarn's five-under par final round. Juntanugarn, the first Thai player – male or female – to be ranked world number one, will now reclaim that spot. Amy Yang, who was tied for first overnight with Jutanugarn, had to settle for a tie for fifth place after a round of 72. England's Bronte Law mirrored her opening round 68 to finish tied for 17th, while Mel Reid (70) and Georgia Hall (72) both finished one shot back on two-under. Scotland's Kelsey MacDonald had started the day on level par, but a final round of 74 left her on three over.